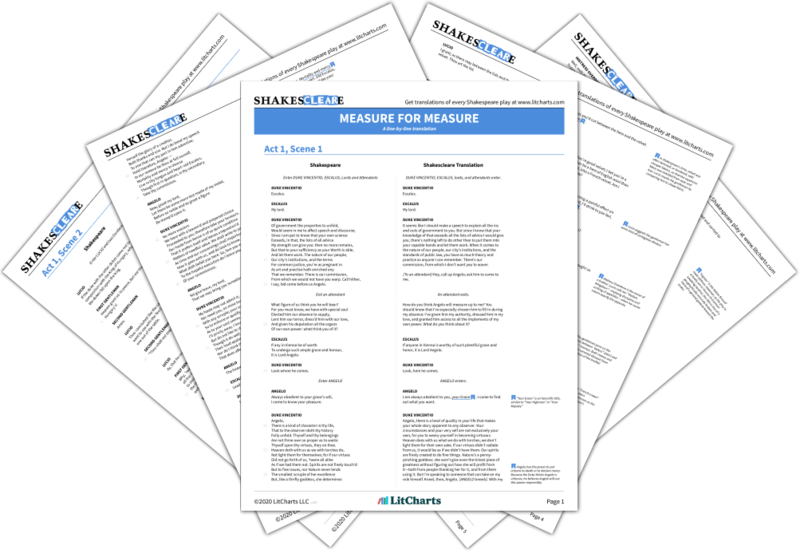 Instant downloads of all 946 LitChart PDFs (including Measure for Measure). The Duke speaks with Friar Thomas at a monastery to request "secret harbour." He explains that he has pretended to leave for Poland and granted Angelo absolute governing power under these pretenses. The goal of this ruse, the Duke elaborates, is to allow law and order to be enforced after 19 years of neglect: "liberty plucks justice by the nose." In order to avoid seeming like a tyrant by enforcing laws harshly after years of gentle rule, the Duke has bid Angelo to act as the enforcer. This way, people will not feel as unfairly deprived of the liberties they enjoyed under the Duke. In order to watch the situation develop, the Duke requests that Friar Thomas disguise him as a friar so that he can observe incognito. This scene complicates the Duke’s character. On one hand, he undoubtedly has the best interests of his duchy at heart by seeking to improve Vienna’s civic morality. On the other hand, however, he seems to be using Angelo as a means of saving face before his subjects and not seeming like a wishy-washy ruler. What’s more, the Duke is deceiving the very subjects he seeks to assist. As the play has already illustrated, too much liberty can be a bad thing. While the Duke may seek to remedy his subjects’ excess of liberty, he himself could be seen to be abusing the complete liberty he enjoys as a powerful ruler. Sobel, Ben. "Measure for Measure Act 1, Scene 3." LitCharts. LitCharts LLC, 19 May 2014. Web. 25 Apr 2019. Sobel, Ben. "Measure for Measure Act 1, Scene 3." LitCharts LLC, May 19, 2014. 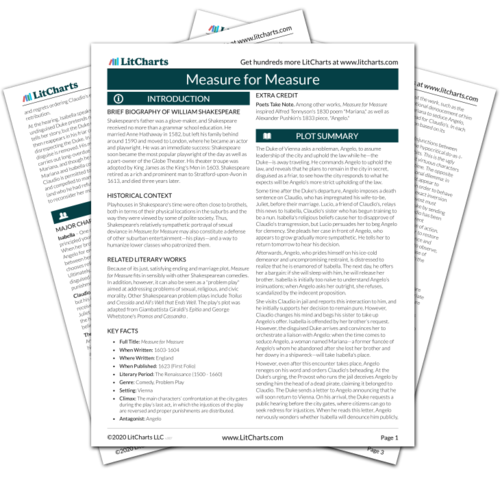 Retrieved April 25, 2019. https://www.litcharts.com/lit/measure-for-measure/act-1-scene-3.